I made an incredibly good batch of dulce de leche the other day. I normally make it from a tube of condensed milk. I’m often too impatient, and open it too soon. But this time I used a tin of condensed milk and left it for hours. When I cracked it open it was thick, dark and luscious. I was inspired… not just to eat it straight from the can, but to do something exciting with it. Several months ago, I did something cheeky. Just before I finished work (knowing things would be tight financially) I bought a set of Wilson’s tiny alphabet cookie cutters. I’d been looking for some for a-ages because I wanted to be able to make biscuit words. I was thinking about homemade Oreos that said ‘thank you’ or ‘happy birthday’. 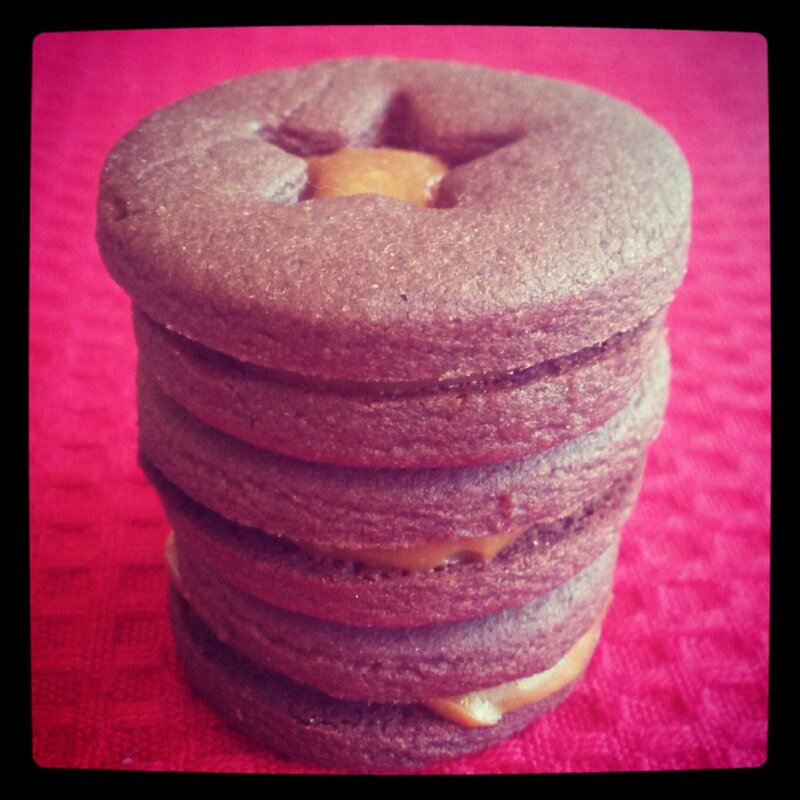 Well, I figured I should make some chocolate caramel sandwich biscuits for Christmas that shared the messages ‘peace, joy, love’. They turned out great. Here they are: delicious and precious! *You can use Nestle Top’n’Fill but I place a can of condensed milk in a saucepan full of water and simmer it for 4-5 hours, being sure to keep the can covered in water. Cream the butter and sugar till pale and fluffy. Add the vanilla and egg. Sift over the cocoa and flour and combine. Knead the dough a little. Press the dough into a disc, cover and refrigerate for 30 minutes. Working in batches, roll the dough 3-4 millimeters thick. Cut the dough into small-medium sized circles and arrange on a lined baking tray. 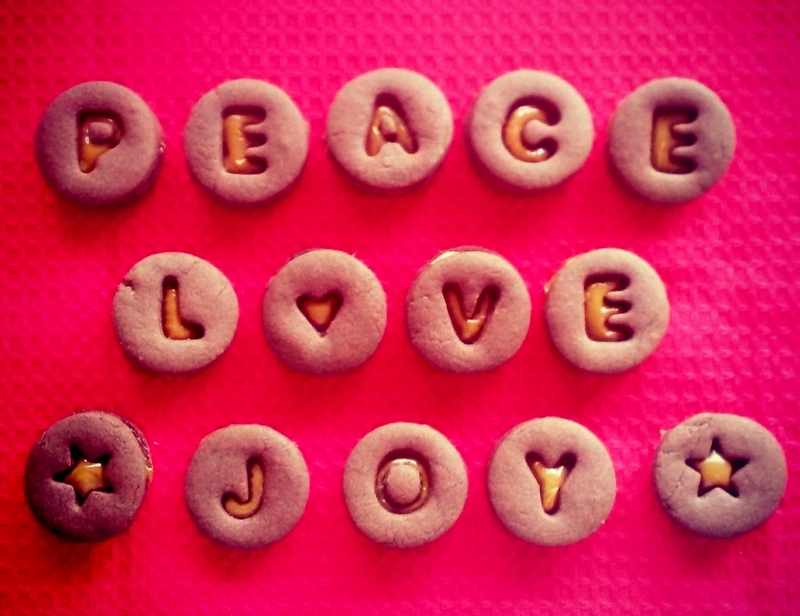 Cut a shape (letter, or otherwise) into every second biscuit using tiny cookie cutter/s. Bake for 10-12 minutes or until just beginning to colour. Leave the biscuits to cool on the tray for a few minutes before transferring to a wire rack. Scoop about half a teaspoon of dulce de leche onto the complete circles, spreading it (as best you can) nearly to the edges. Top the caramel with a circle with a cut out and press down to sufficiently spread the caramel. Leave the biscuits for at least a day, to allow the biscuit to soak some of the moisture from the caramel. This entry was posted in In-Betweens, Morning or afternoon tea, Snack and tagged biscuits, chocolate, Christmas, edible gift. Bookmark the permalink.